Sunday December 9, 2018 from 11am – 4pm. 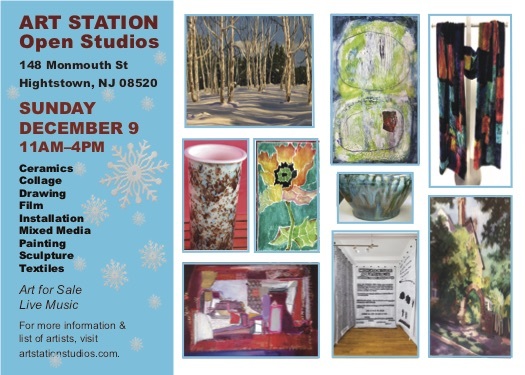 Art Station welcomes the public to tour its historic building, view the art and meet the artists during its semi-annual open studios. Enjoy live guitar music by Lance Reichert and light refreshments. The eclectic art mix includes ceramics, collage, drawing, film, installation, mixed media, painting, sculpture, and textiles. Artwork will be available for purchase. This entry was posted in Artist Announcement, Artists, Open House Events, Uncategorized. Bookmark the permalink.